3. Why the Firm and Not the Market? While for convenience one usually measures opportunity cost in dollars it actually involves real alternatives foregone. 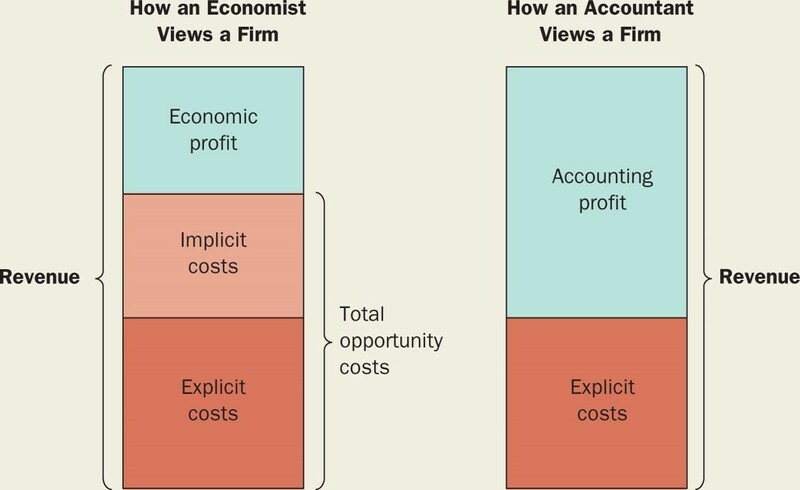 Thus for a firm, the opportunity cost of producing (OCP) a good (and therefore opportunity cost of employing factors of production) is the next best alternative action. There are two components to a firm’s OCP : explicit and implicit costs. Explicit costs are paid directly in money; implicit costs or opportunities foregone are not paid directly in money (even though measured that way). b) interest could have been earned on capital used to purchase equipment. If a firm borrows money to buy it then it pays the explicit cost as interest on the borrowed money but if uses its own cash it foregoes interest earned e.g. in bank deposit, and becomes an implicit cost. There are some costs, however, that are not treated as economic costs. For example, sunk cost or past economic depreciation are not counted as an economic cost. Once capital equipment has been bought any alternative opportunity is foregone and cannot be retrieved except by selling. Similarly, once equipment has been depreciated the cost is sunk and cannot be recovered. It is important to realize that accounting measures of depreciation differ from economic depreciation. In accounting one often uses some form of straight line depreciation, for example, over 20 yrs for buildings or 3 years for cars and computers. In economics depreciation continues until there is no resale value and interest to be earned as an opportunity cost no matter generally accepted accounting principles (GAAP), i.e., 'vintage' equipment with zero book value may be a productive asset especially if the cost of other factors of production can be reduced, e.g., worker coop purchase of mills and mines usually involve a drop in wages & salaries or Third World countries with 'vintage' plant & equipment but low wage labour. This stage can be associated with technical obsolescence, i.e., it can continue to do the job but is not at minimum optimum scale and lowest cost per unit. All usefulness must be exhausted and then the shell simply thrown away or sold as junk. This is the final stage called functional obsolescence, i.e., it can no longer perform the job it was designed to do. The second type of implicit cost faced by a firm is the stock of raw materials, semi-finished goods and unsold finished goods, i.e. inventories. The opportunity cost of inventories can be calculated in a number of ways including estimating their current market price using the 'first-in-first out' (FIFO) or 'last-in-first out' (LIFO) methods. The third form of implicit cost faced by a firm is the opportunity cost of the owner's resources. This includes the time and effort the owner could have made employed elsewhere earning a wage or salary. The OC of entrepreneurship is called ‘normal profit’. In general, efficiency refers to the ratio of outputs to inputs. To measure efficiency one must therefore be able to calculate both inputs and outputs. This is most easily done in the production of goods rather than services, especially in manufacturing, e.g. cars produced per worker. Technical efficiency is achieved when it is not possible to increase output without increasing inputs. Economic efficiency occurs when the cost of production for a given output is as low as possible. A secondary consideration is that such output is sold at a price sufficient to compensate all factors of production at their normal rates, i.e., no excess or economic profit or rents are earned. Thus all economically efficient solutions are technically efficient but not all technically efficient solutions are economically efficient, that is, something may be technically possible but uneconomic. It can not pay its own way, e.g., space exploration and the military. The firm is an institution that hires factors of production to produce goods and services. Markets are also institutions that can coordinate economic decisions. Why should some economic activities take place in the one or the other? The answer is 'cost'. Firms internalize economic activity because of a number of factors including: transaction costs, economies or diseconomies of scale and economies of team production (specialization). Transaction cost include: the costs of finding someone with whom to do business; the costs of reaching agreement on exchange; and, the costs of ensuring such agreements are fulfilled. Markets require that buyers and sellers find each other, get together and negotiate. They also usually require lawyers to draw up contracts. Rather than buying a good or service on a market, firm can reduce such cost by internalizing their production. It is important to note, however, that while at any given point in time may be cheaper to buy on a market rather than produce within the firm (out-sourcing), at another point in time cost may change and it becomes cheaper to internalize production of necessary factors of production. Economies of scale exist when the cost per unit output falls as output rises. Economies of scale are due to specialization and division of labour. A firm will tend to internalize an economic activity if its scale of production allows it to enjoy such economies of scale. On the other hand, diseconomies of scale occur when the cost per unit output increases as output rises. Diseconomies of scale can occur as a firm grows in size and complexity. Some things are more cheaply done at a smaller scale of production, e.g. due to congestion. In fact, some entire industries are based on 'small scale', e.g. creative products like art, advertising and R&D. These activities are often more efficiently conducted in small rather than large firms. In entertainment and advertising the same result can sometimes be achieved by creating special small scale production units while the main administration of the enterprise handles marketing and other activities that benefits from economies of scale. Another factor leading firms to internalize certain activities is specialization in mutually supportive tasks or team production. Putting a designer together with an engineer and other specialists within the firm may be cheaper than trying to buy such services on the market and then try and coordinate their various outputs. In the Standard Model technological change refers to the impact of new knowledge on the production function of the firm. The nature of that knowledge whether from the Natural & Engineering Sciences (NES), Humanities & Social Sciences (HSS) or the Arts is not identified only its mathematical impact. Such new knowledge may be endogenous, i.e., a result of the profit seeking activities of firms. Or it may be exogneous, i.e., the result of the curiosity of inventors and the search for knowledge-for-knowledge-sake, i.e, pure research usually conducted in universities. For those interested in a fuller description of technological change please see Observation #7: Technological Change.